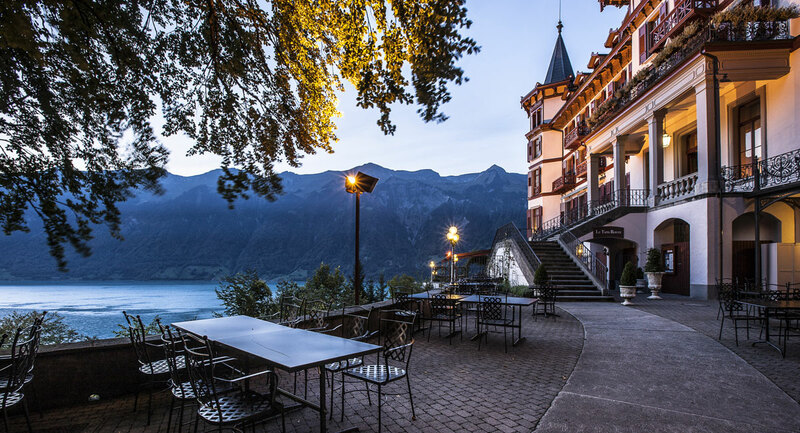 Today, just as it was one hundred years ago, the historical hotel residence, by the celebrated silvery Giessbach Falls, high above Lake Brienz, is quite simply a world of its own. Surrounded by mountains, forests and alpine meadows, this fairytale-castle boasts a breathtaking view of the unspoiled landscapes of Lake Brienz. Relish the chance to unwind in this friendly and hospitable oasis, far away from everyday hustle. The Grandhotel Giessbach opened its doors in 1875. Thanks to the rescue by a foundation set up by Franz Weber, it still stands today. Since 2014, the gardens have appropriately adorned historical ornamental plants from the ProSpecieRara Foundation, which is committed to the conservation of endangered ornamental and useful plants. Three collections were created: a dahlia collection, a hydrangea collection and an Astilbensammlung collection. On the panoramic terrace, the shady places offer optimal living space for the 39 Hydrangeas and 16 Astilbensorten. Dahlias bloom in the sunny places from July to October. The collections are a showcase of past times and are also of great value for the protection of these varieties.